Despite a previous foreclosure or short sale, many homebuyers are returning to the market. These are called boomerang buyers, and Inman reports a lot of this activity due to FHA activity in 2015. Through July of this year, FHA buyers accounted for 22 percent of all financed purchases of U.S. single-family homes and condos. That includes boomerang buyers recovering from a previous homeownership experience that ended in foreclosure or short sale. RealtyTrac reported in early 2015 that more than 7 million American boomerang buyers plan to buy a home. 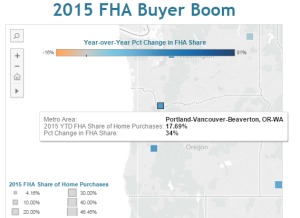 Oregon first experienced a wave of boomerang buyers in 2013, a market segment that remains active in late 2015. Remember, a previous foreclosure does not exclude a buyer from qualifying for a loan on the next try. Our team works with boomerang buyers all over the Portland Metro Area, so give us a call when you’re ready to look for your next home.